You've hit the jackpot with the Schwaben European Essentials Tool Set. Never again will you be cursing the unique fasteners on your European automobile. Instead, you'll take to the task like a conquistador of cars. The garage is your El Dorado. 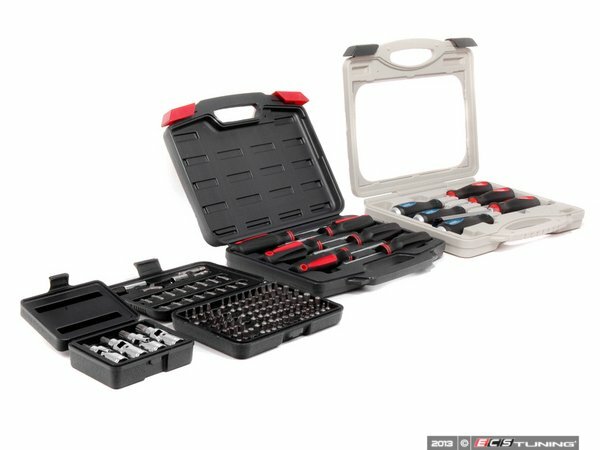 Featuring swivel-head triple-square bits, Torx screwdrivers, one hundred specialty fasteners and the sturdiest screwdriver set you'll lay hands on, this kit will make you feel like a king. Each tool rests in its own place in molded cases, helping you keep track of your investment. The Schwaben Essentials kit is worth its weight in gold. :: ECS Tuning :: Schwaben Tools - Brake Caliper Essentials. Quick Reply: :: ECS Tuning :: Schwaben European Essentials Tool Sets! !